When things take up space, we often need to measure them. We need to find out how much space they take up! Volume is one way that we can measure matter. How much space does an object take up? Which of these objects takes up the most space? The desk, the bed, the bookcase, or the nightstand? Obviously, the bed is taking up the most space. It looks like the bookcase is next. Then it's the desk and the nightstand. Mass is another way of measuring matter. How much matter does the object have in it? Or, how heavy is it? We use a measuring scale to measure the mass of an object. We can measure mass of different objects and know which ones are heavier and which ones are lighter. Temperature is another way of measuring matter. How much hot or cold an object is? We use a thermometer to measure the temperature of an object. Let's see how these food items are arranged according to their proper temperature. Ice cream is very cold. So, it is put in the freezer. Lettuce is cool, so we put it in the fridge. Potato chips are at room temperature and can be kept in the cabinet. Pot of soup is always served hot, so we keep it on the stove. Another way of measuring matter is density. Density is the word we use to tell how tightly packed things are. Solids, liquids, and gases have different densities. When something has more density, it sinks, and something less tightly packed will float. Think about the oil floating on soup. Which one do you think has more density, the oil or soup broth? Soup broth is denser than oil. Now, let's compare the density of two different solids, a block of concrete and a block of styrofoam. These two blocks have the same volume. They take up the same amount of space. But which has more density? Which is more tightly packed? Can you guess? Concrete block is more dense than a styrofoam block. Now let's compare the density of different gases, hot air above fire or cold air above ice? 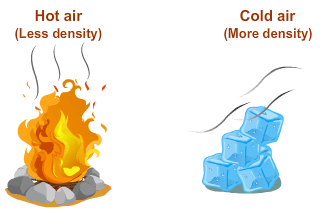 Cold air above ice is denser than hot air above fire. Matter is anything that takes up space. We can measure matter by its volume or its mass. We can also measure it by its temperature or its density. Volume measures how much space something takes up. A bed takes up more space than a nightstand. Mass measures how much matter is in an object. A metal trophy has more mass than a stuffed toy. Temperature measures how hot or cold something is. Soup boiling on the stove is hot. Ice cream in the freezer is cold. Density measures how closely packed matter is. A block of concrete is more closely packed than a block of Styrofoam. Matter floats when it is less dense than the material around it. Oil is less dense than water, so oil floats in water. This activity will help you measure the volume of different objects. Which one has the most volume? Fill all the cups half with water. Mark the water level on the side of each cup with a marker. Put one of the four objects in each of the first four cups. Do not put anything in the fifth cup. Watch how much water rises in each cup. Mark the new water level. This shows you how much space the object takes up in water. Measure one cup of popcorn kernels. Place it into one side of the pan balance. Find out the weight of the popcorn. Remove the popcorn. Measure one cup of popped popcorn. Place it into one side of the pan balance. Find the weight of the popcorn. Which type of popcorn has more mass? Now you can use the popcorn to measure density. Pour some popcorn kernels into the cup of water. Pour the same amount of popped popcorn into the water. What happened? What can you tell about the density of the popcorn kernels and the popped popcorn? Now you'll measure the density of some liquids, and observe things that float and sink. Pour some corn syrup in one cup, water in another, and oil in another. Fill each cup about 1/4 up. Test each of the objects to see whether they float in the liquids. Write down your results. Which of the liquids has the most density? Now, in the fourth cup, pour some of each type of liquid. You can re-test your floating objects to see how they do in the three combined liquids. Record your results. Now you can measure the temperature of different items. Fill the first cup with ice, then add cold water. Fill the second cup with cool water (no ice). Fill the fourth cup with hot water from the tap. Fill the mug with very hot water, heated on the stove or the microwave. Take the temperature of the lukewarm water first. From this, try to predict the temperatures of the water in the other cups and the mug. Write down your predictions. Use your thermometer to measure the temperature of the water in the other cups and the mug. Record your results. Were your predictions close to the actual temperatures? Which water had the lowest temperature? How much colder was the ice water than the cool water? How much hotter was the heated water than the hot tap water? A bouncy game for Grade 2 kids to strengthen their.. 48,379 Plays Grade 2	(897) What's the Matter? A bouncy game for Grade 1 kids to strengthen their.. 85,367 Plays Grade 1	(1304) What's the Matter?